You are here because you are wanting to support Plant-Smart Living or, at least, are curious about how to do so. But first, before we talk about the different ways in which you can personally support Plant-Smart Living, let me first talk to you about the PSL story, my mission and my vision for its future. In early July 2015, after heightened pressure from my family and friends to begin recording videos of my garden, which I have been growing and expanding upon for 25+ years, I finally caved in and recorded my very first YouTube video - a 23 minute tour of my organic vegetable garden. Since that time, several people have contacted me who were wanting to support my ongoing efforts to spread the plant-based message. This page goes way beyond just ‘support’ though. It is really about so much more. They had wanted a more ‘personal’ experience. They had wanted to be more involved in the ‘process’. They had really wanted to be involved, somehow, in what I was building and creating with Plant-Smart Living. They had wanted to feel a part of something that was much greater than you or me. It quickly became clear that they believed wholeheartedly in what I was doing, the uniqueness of it, as well as, the message I was working tirelessly to spread. Fortunately, you discovered Plant-Smart Living at the perfect time! It is still very young. It is still very much in its infancy. But, I could REALLY use your support to help turn it into everything I envision it becoming. With that in mind, I’ve turned to the Plant-Smart Living Community to help drive it forward. In even the smallest decisions, from the earliest days of Plant-Smart Living, I have involved the community. They are truly some of the greatest people on Earth. Create a stunning and powerful logo crafted with the purpose of representing everything Plant-Smart Living IS, and everything I hope for it to become in the future. Pick a pressure cooker, in order to be used in my YouTube videos, as well as for experimentation as we have created and shared with the community many great whole-food plant-based recipes. Construct a content posting schedule (for Facebook posts and YouTube videos), in order to establish consistency in the content we deliver, as well as, predictability. Decide upon a new, upgraded, camera, in order to deliver a much better user video viewing experience, across all the many different types of YouTube videos that I produce. Most importantly, they have helped me to stay encouraged, despite personal attacks by those who would love nothing more than to see Plant-Smart Living fail, and it's message fall to the wayside. Based on those past experiences, it seemed to be intuitive that Plant-Smart Living–and everything it stands for–would succeed, or fail, on the back of the community. It is about the MESSAGE. If you feel that you have personally benefited from anything here at Plant-Smart Living–recipes, videos, blog posts, resources, etc–it would be an absolute honor to have you join the thousands of others who have supported me at different levels…and consider supporting me in one or more of the following ways below! I truly appreciate this support. This level of support consists of items that are really the online equivalent of simply becoming familiar with Plant-Smart Living and me. Face-to-face, this would be akin to a hearty handshake at the very beginning of a first encounter with someone I hope to form a relationship with. If you are already familiar with Plant-Smart Living and my journey, perhaps through my Facebook page or through my YouTube channel, it is possible that you may have done some or all of these items already! With that said, in a world that is absolutely saturated by big businesses and brands who are vying for YOUR attention, it means so much to me just to have the opportunity to be able to share with you the power of the plant-based lifestyle–a lifestyle that, at age 61, has radically changed my life and many of my family member’s lives. With TIME being truly a precious and valuable commodity nowadays, it is such an honor that you would choose to spend just a little time here with me! We have put a lot of effort and energy into maintaining our social media platforms, creating and uploading new videos frequently, and creating this website. Just taking some time to get to know us better is a easy way to show your support without having to do too much! This level of support consists of items that are really the online equivalent of forming a relationship with Plant-Smart Living and with me. After a hearty handshake, and some time getting to know each other, this level is where you can take our relationship to the next level. Maybe you have been following Plant-Smart Living since the very beginning, or perhaps you are new to Plant-Smart Living…either way, I greatly appreciate your support at this level! Join My Facebook Community - Coming Soon! Join My Facebook 'Best Plant-Smart Recipes Group' - 1,000+ members already! Like My Past Facebook Post(s) - Because our past posts consist of pictures, or videos, or both, the best way to LIKE them is through either our photo stream page or video stream page, or just by scrolling down on Facebook. Learn Something - Beyond simply "exploring" this website, I would be happy if you were to learn something - anything - while visiting Plant-Smart Living! Here, at Plant-Smart Living, we value the power of the human intellect. We believe in the power of humans to "question everything," especially in relation to our eating habits and lifestyle choices! I have worked very hard to ensure that you learn the things you need to learn in order to succeed at living a more 'Plant-Smart' lifestyle yourself. Your thoughts, opinions, and personal experiences are so important to me! 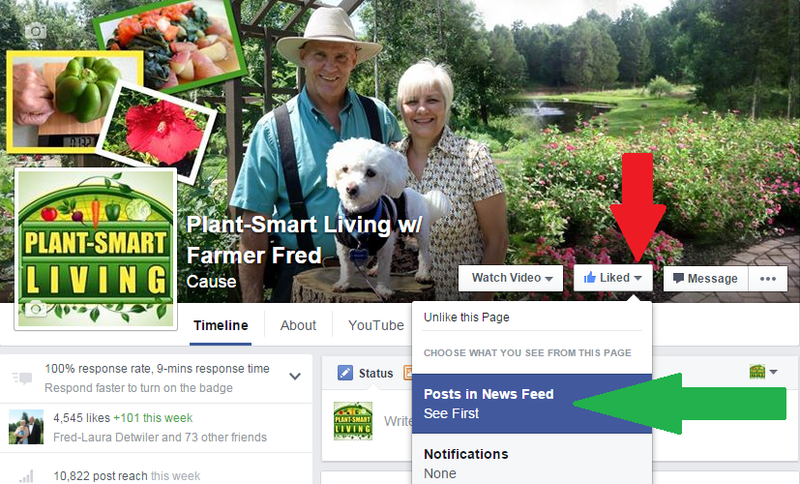 Whether you visit Plant-Smart Living on Facebook, YouTube, or any of my other social media outlets, you will likely notice that I strive hard to be as conversational as possible–asking you questions, and engaging with you, almost as if we were actually meeting face-to-face. Likewise, it means so much to me just to have you respond and comment! Even when you do something as simple as commenting, this helps support Plant-Smart Living because it is those same comments that others see, as a social proof of sorts, before deciding whether or not to comment themselves. Not only is this valuable, but it is extremely powerful! Also, when you do comment, I personally strive to respond in a timely manner, especially to those who put some thought and effort into what they are saying. Comment on Blog Posts, Recipes, Gardening Posts, and more - Your comments help bring our website to life. Many of our posts are meant to simply be seeds for discussion. The comment section is a great place to ask questions to Farmer Fred as well, who has a range of expertise in gardening, vegan living, and working as a contractor. Sharing content created by Plant-Smart Living is simple today, and is an essential way to support our cause. If you find yourself really enjoying a new, homemade vegan recipe or a gardening tip (or anything else! ), feel free to spread the word. This can, of course, be done face-to-face with family and friends, but can also be done online as well. Share My YouTube Video(s) - At the time of this writing, I have published over 300 YouTube videos. If you watch a video and found the information provided to be really useful or otherwise entertaining, sharing it helps pass this along to others and will impact visibility of our video content. Share This Website - The ways of sharing our website are virtually limitless. Just copy and paste our website link, or a specific post link, and send an email, instant message, post on social media, etc. When you share this website, you make an invaluable vegan education and lifestyle site available to many others who will no doubt benefit from what this site contains. I would like to take just a quick moment to personally THANK YOU for the time you have spent here, on Plant-Smart Living, just reading this page! …Now, if you are curious about how you can support us financially WITHOUT actually giving us money, HERE is how…. On this SUPPORT page, along with other pages on this website, we use what are called affiliate (or referral) links. These links are a way for you to support us financially simply by purchasing products that we have actually used and benefited from ourselves in our Plant-Smart journey. Whenever you are wanting or needing a product–whether it be a general home goods item, a luxury item, or a present/gift for a holiday or special occasion–if you use our link(s), at no additional cost to you, we will earn a small commission when you purchase. This is a website platform that allows you to commit to varying increments of monthly financial support. More specifically, in any given month, you will pledge to a certain amount of financial support per month. This option is for those who believe in what I am doing with Plant-Smart Living, and that want to become a 'patron' of Plant-Smart Living. I will explain these 'buckets' in more detail in just a moment. If you have followed what I have been doing with Plant-Smart Living for any amount of time, you have hopefully noticed that there are many different forms and types of content that we create here. If you would like to donate to any one of these endeavors, in particular, you can do so below. Consider these to essentially be "buckets" to which you can donate. For the first four (4) options, you can essentially mark your envelope - declaring EXACTLY where you would like your money to go. For the last option - the BLUE bucket, a more 'general' option - this is where you money will go to support us on a personal level. Where the first four (4) buckets represent your opportunity to support Plant-Smart Living, by allowing us to purchase the TOOLS necessary to help continue to build it and see it succeed, in this bucket your contribution will go directly towards the human capital behind this endeavor. If you have been following what we have been doing with Plant-Smart Living, for any time now, and IF you feel you have personally benefited from it in any way, it would be an absolute honor to have you support us through Patreon. Red Bucket - PSL Video Content-Related Creation Patreon - This Patreon bucket includes all aspects of creating, editing, tracking, improving, uploading, and managing video-related content, and all its associated analytics on Facebook, YouTube, and any other video-capable platform we expand to in the future. When you pledge your support, you will benefit from improved video quality by enhancing our production-related activities such as scripting, upgrading equipment and software, and much more! Yellow Bucket - PSL Social Media-Related Creation Patreon - This Patreon bucket includes all aspects of creating, editing, tracking, improving, uploading, and managing social media and community-related content, and all its associated analytics on Facebook, Twitter, LinkedIn and any other social media platforms we expand to in the future. When you pledge your support, you will benefit from an enhanced social media experience. Orange Bucket - PSL Website-Related Creation Patreon - This Patreon bucket includes all aspects of our plant-based recipe-related content development and presentation. When you pledge your support, you will benefit from enhanced recipe instructions, vegan education, gardening tips to produce your own food, and an improved sensory experience. Green Bucket - PSL Website-Related Creation Patreon - This Patreon bucket includes all aspects of creating, editing, tracking, improving, uploading, producing and managing content, and all its associated analytics, as well as improving your user experience through website upgrades. When you pledge your support, you will benefit from an enhanced website experience designed to promote the growth of the Plant-Smart Living community. Blue Bucket - Plant-Smart Living (General) Patreon - The investment of time and money required to sustain Plant-Smart Living on a day-by-day basis is enormous. As you can see from the previous Patreon buckets, not only is Plant-Smart Living a true labor of love that myself and my team are very proud to work on, but it is also very large in scale. While my other Patreon buckets are driven by milestones specifically geared towards acquiring new tools and resources needed to sustain the technical aspects of Plant-Smart Living, this bucket is entirely dedicated to offsetting the high costs of manpower required to keep Plant-Smart Living running. If you are uncertain of which bucket to choose, or if you would like to support Plant-Smart Living beyond helping us purchasing necessary tools and resources, then THIS bucket is the bucket for you! Should you have any questions about any of the Support Levels, feel free to contact me directly using the form below.